Niclas Gronholm has won the inaugural World Rallycross of Abu Dhabi. This is his first victory in the World RX round in his life! Great success of the GRX Taneco. 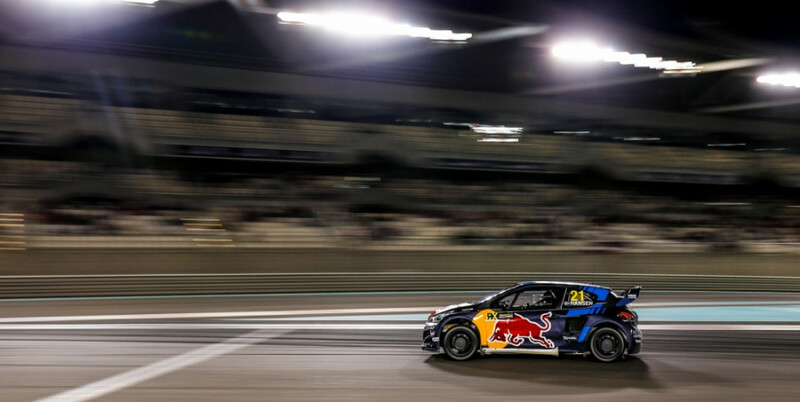 Sweden’s Kevin Hansen set the fastest qualifying time of the weekend at the World RX of Abu Dhabi, round one of the FIA World Rallycross Championship at Yas Marina Circuit to take his first ever World RX TQ (top qualifier) position. Team Hansen MJP driver Hansen made the best start in the last race of qualifying and finished in front of Latvia’s Janis Baumanis, but it was race one winner, Germany’s Timo Scheider who was second quickest overall. Hansen started on the front row for semi-final one under the flood lights of the Yas Marina Circuit, joined by Scheider. On pole in semi-final there was Finland’s Niclas Gronholm, the GRX Taneco star fifth in Q4. Niclas Grönholm storms to victory at #AbuDhabiRX after a fierce battle with Kevin Hansen! The contact between the pair is currently under investigation.